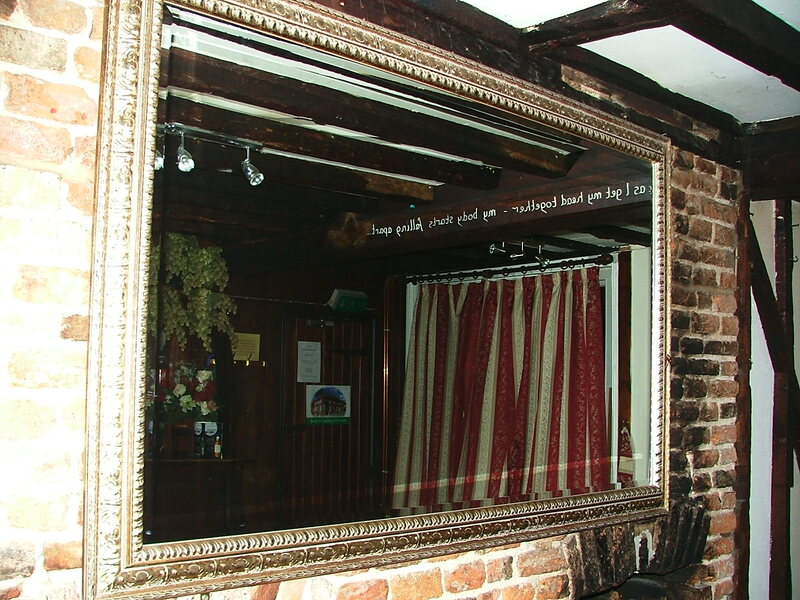 The Kings Head Public House was subject to a Ghost Connections investigation at the invitation of Simon, the landlord, in February of 2007. Based upon our experiences on our previous visit we decided a return visit beckoned and we were kindly allowed back. The known history of the building is described in our previous report and can be read online by clicking on the link previous report. Inside the building consists of a front public bar and rear restaurant areas divided by an open bar facing both rooms on the ground floor along with stair access to the private rooms above the main building and another to the function room which is above the ground floor kitchen in the annex. 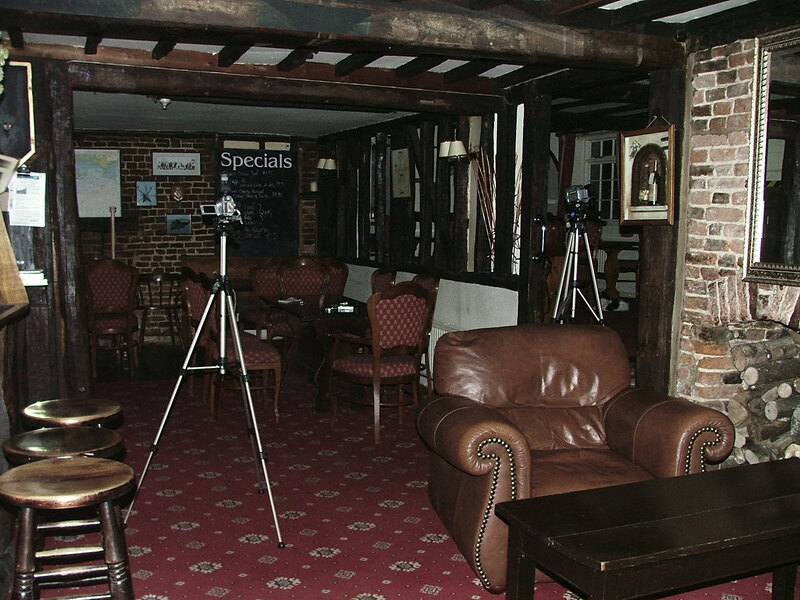 To investigate reports of paranormal activity at The Kings Head public house. There are very few reports available in any sources known to the Ghost Connections Team. However it has been stated by staff that the kitchen fryers were prone to switching themselves on after having been turned off at the mains and that glasses have been reported to have fallen by themselves from shelves around the bars. The second of these reports only came to the teams attention on the night of the investigation so no plans were made to investigate this report. Simon, the landlord, had invited the team out of interest and not through any substantiated reports. In the light of these reports the team decided to investigate for themselves if the Kings Head is subject to any of the alleged phenomena. On this occasion our guest, and employee/lodger Emma would tell us an account of how she had placed a candle on the pool table in the function room and returned to find it on the floor. Would any of this alleged poltergeist activity reveal evidence of itself to the team on this visit? Due to the opening times of the public house this was a late night start and the team had previously visited an outdoor location and arrived at The Kings Head ready for a second investigation. After introducing ourselves to Emma we discussed a plan for the evening and ensured our guests were happy with the various methods we would employ. During this discussion Emma would express some feelings she held about going to the cellar when in the course of her work. 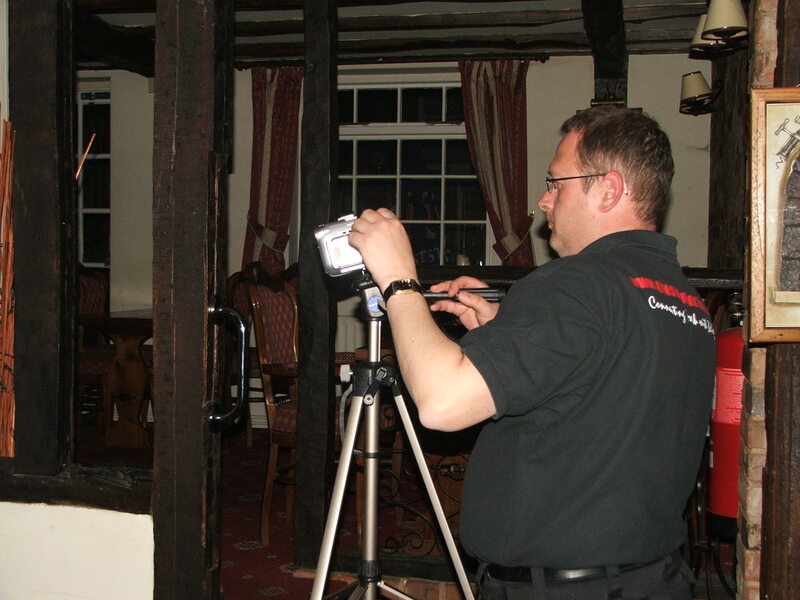 Ghost Connections does not generally investigate public house cellars for reasons of evidential integrity and damage to stock that may occur if all equipment were turned off to establish integrity of anything presented by the team. 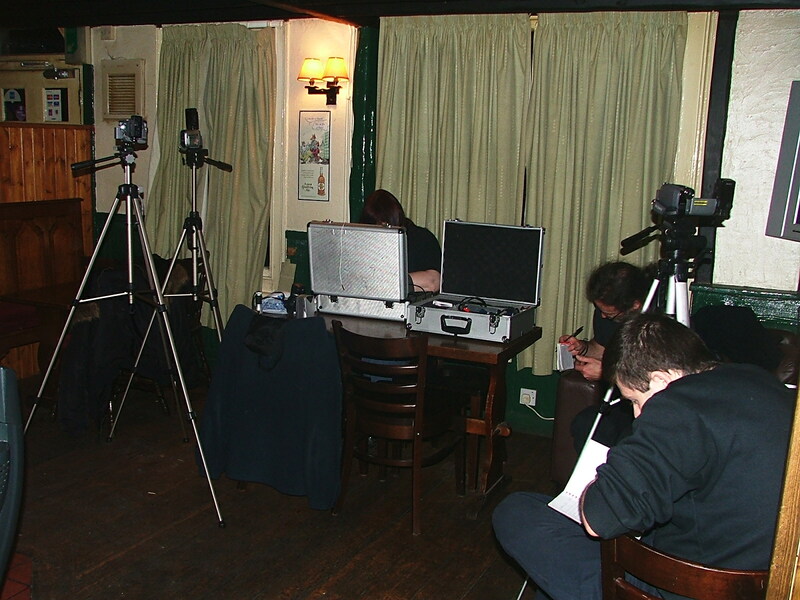 Temperature readings were taken as we set up our equipment in the front bar area. It was 21.1deg Celsius. No fire was burning on this occasion and although kindly offered we declined for it to be lit to avoid undue noise and light sightings. All doors were locked and secured and motion sensors were placed inside of the main door from the street. By virtue of the previous investigation it was decided that the investigation would commence with a quiet vigil in the function room. As on the previous occasion we sat ourselves around the hall at regular intervals. This way we hoped to gain a reasonable perception of the location of any noises heard. This would also serve to ensure that no persons were able to whisper to the person next to them and all audio would be heard clearly. The temperature here was recorded at 21.8deg C.
As noted in the previous report the passing traffic could be heard distinctly and the lights from it formed obvious patterns against the curtains which we drew to keep as much light out as possible. There was a red IR alarm light above the door which would pick up upon Paddy's movement although we could not see any exaggerated movements with the naked eye in the darkness. Some time was spent listening to the natural sounds both inside and out and becoming accustomed to the lack of light. After some time Dave called for any persons to make themselves known. Kim notes a nervous feeling in her stomach. Emma (sitting two seats from Paddy) states that she feels colder. Half an hour had elapsed and the temperature generally in the room was now 21.06deg C.
All of us would hear a series of noises. Paddy notes one as sounding like a small animal running. Others hear a dull thud in the area where Paddy is seated. Another is heard further towards the centre of the room near the pool table (a distance of about 6-8 feet from the first). During this experience a noted drain of energy was drifting through the team. Both Kim and Dave would feel this. A plea is made for the noise to be repeated and nothing is forthcoming although Paddy comments that he sees movement out of the corner of his eye. This is not limited to one location. Emma agrees with this. Temperature remains at 21.06deg C.
Another 'thud' is heard nearer to Dave than the last. The noise is of the same volume and tone on each occasion and it is noted that it occurs at regular 5 minute intervals. After 1 minute there is another similar noise. There is no further noise for 17 minutes when another occurs near Dave. In the intervening 17 minutes Kim feels colder and nauseous. Dave sees a small green light travel diagonally bottom right to top left against the wall paneling to the right of the fireplace near to Paddy. 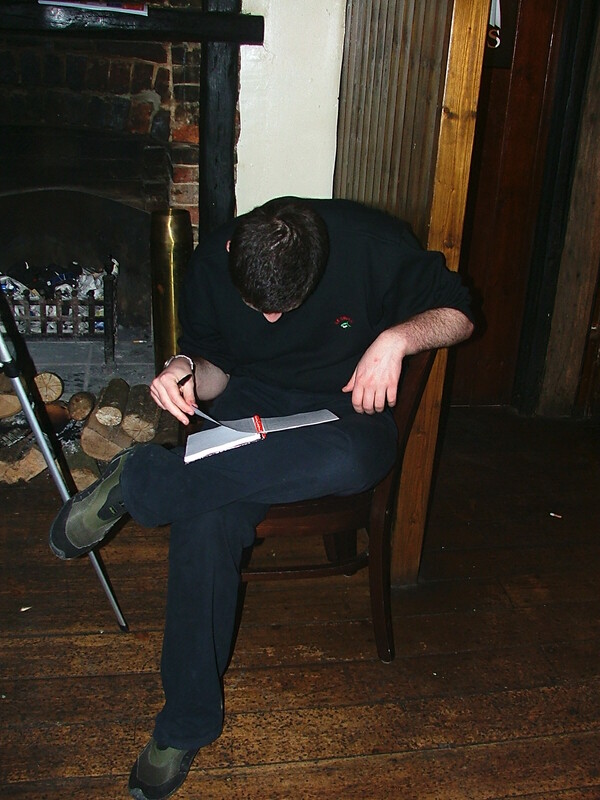 Paddy notes a tap from the area of the fireplace whilst noting the appearance of shadows of persons. The temperature was noted to have risen again to 21.6deg C. Paddy would note the sense of a large man behind the bar, which was immediately behind him. Paddy would then describe the feeling of a presence to Dave's left and a few 'Corner of Eye' movements. Clairvoyant information was forthcoming at this time. A slight tap was heard by all again but the team were unable to come to a conclusion as to where this was. Paddy notes the presence of more shadows. The temperature was now 21.4deg C.
A photograph of the area where Paddy and Emma were sat is produced below. The team then took a break and discussed their findings. Simon retired to bed and Emma wished to remain with the team for the rest of their investigation. During this break the temperature in the bar was noted to be 23.7deg C.
It was decided that the next area to investigate would be the rear bar / restaurant area. 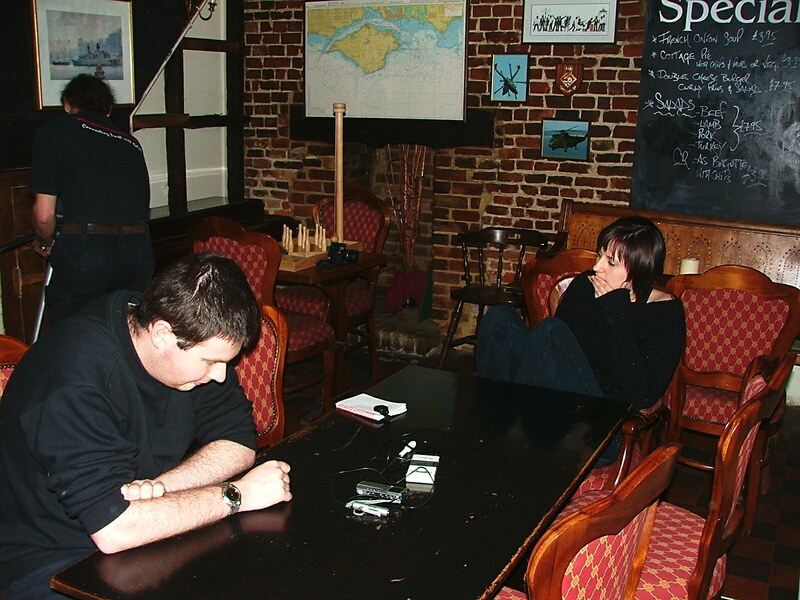 The team with Emma sat around a table in this area to conduct a vigil by way of séance. Emma would observe from a seat at the same table. Three video cameras and a voice recorder would be used to record the proceedings. 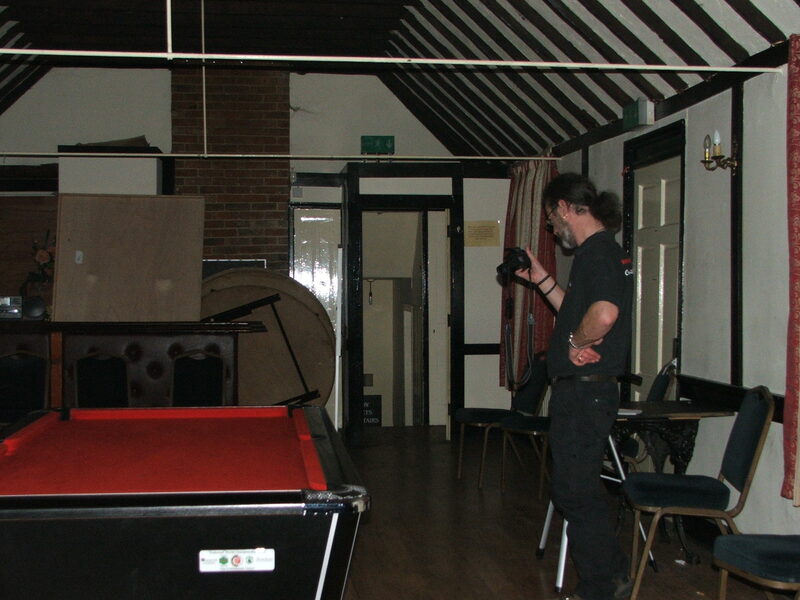 The fourth camera was set up to record a set of bar skittles which were set up as a possible trigger object / focus for poltergeist activity. The other voice recorder was left to record in the front bar. The temperature in the restaurant was 22.3deg C. The team joined hands observed by Emma and the séance began. All of the team (except Kim who has her back in this direction) would note shadows moving around towards the window nearest the sofa and ladies toilet. Paddy would comment that he saw hands entering the circle created by the séance. This reminds Dave of old accounts of seances during the 1920's where 'materialisation' of hands are alleged. It was decided to focus the energy on this aspect in an effort to see if this could be replicated. A number of noises would also be heard from the area of the bar. Kim has an urge to stand during this séance. She notes feelings of irritability and her legs begin to shake. Kim also reported a feeling of being pushed in the back at one point. Emma comments that on two occasions she heard murmering like a group of people talking in the distance and this is supported by Paddy. After a break a final séance would take place in the front bar area. By now it was late and some of the team were tiring. Emma remained with us and joined in this time. Nothing was noted although the temperature was now 21.07deg C.
From the function room we established that one bang was in fact Paddy shifting in his chair although all other noises remain unexplained. A source was impossible to locate due to the random locations of the noises. It has been agreed by the team that the noise was the same on all unexplained occasions. It was, at first, believed that the noise may be repetitive and natural due to the regular time period between them. This changed immediately that this was commented on by Kim. All passing traffic created the same light illuminations within the room and was also accompanied by the sound of the moving vehicles. The light seen by Dave was not of this type. The only other light source in the room was the red I/R light on the alarm system as previously mentioned. The occurrence of a green light appearing to move in a diagonally rising path remains unexplained. There was a proliferation of sightings of shadows by both Paddy and Emma. There were no other persons within the room and nothing outside that would create a shadow of the type seen. No source for the creation of these was established. A sense of persons moving about was a common theme. Could the senses of movement in the area of Dave when he was receiving information from a spirit sensed by him to be next to him be coincidental? Neither Paddy nor Dave communicated what they were seeing or engaging in at the time although each was recorded. Did Paddy somehow sense the communication that Dave was having? Sensations of being cold are not uncommon when sat in one place trying not to move for long periods. What is of interest here is that there were temperature fluctuations recorded at the same time. Photographs of light sources are often easy to explain away. 'Orbs' are commonly found by camera flash function to be insects or dust / moisture. The photograph of where Paddy and Emma were sat shows a light anomaly between Dave's camera and the chair on which Emma was sat. Unusually it appears either to be in motion or a 'twin' and of a lilac hue. It cannot be relied upon as evidence yet it is coincidentally interesting. Sensations of energy loss are common with long periods of inactivity after periods of remaining awake for long periods of time. The majority of the team were experiencing this yet this was our first location of the night and so we should all have been alert. Does the sensation of energy loss and tiredness explain the other observations. We believe not as most of these were recorded by Paddy, who even by the end of investigation was the most awake of all of us. The voices heard by Emma and Paddy did not feature on any recordings made and cannot be substantiated although it is known that no one else was in the area at the time. 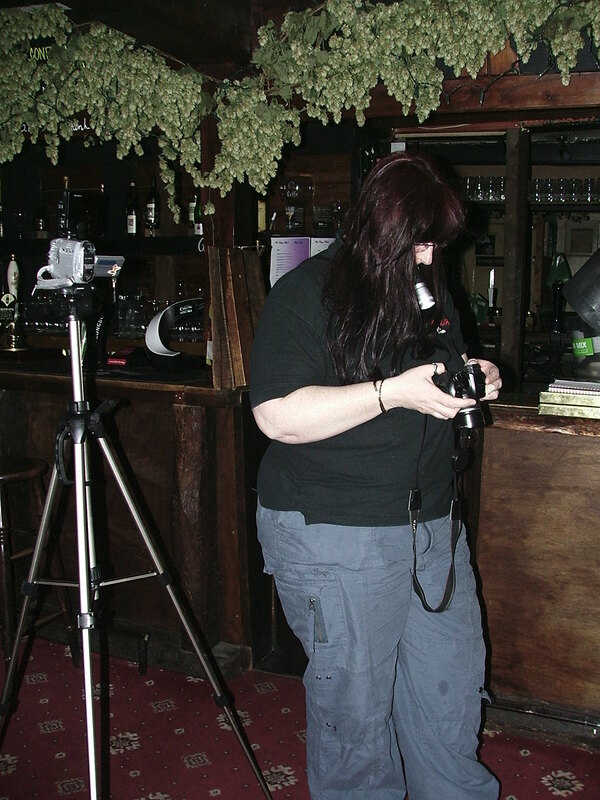 It is of interest that the team see shadows moving at a similar time and there are also noises from behind the bar. The connection between the observations is interesting and unexplainable as the three phenomena are unlikely to be caused by the same natural source. The shadows in the area of the window were explored and could not have been caused by someone else on the outside of the window due to it being well above the level of the street. This should be compared with the location of the noises in the previous report. The noise from the bar area could not be located. It was not a noise that had been occurring with regularity and although not occurring upon request immediately did recur later. Repetition of this noise in a short period yet not occurring at all within the rest of the one and a half hours we were in this area is worthy of note. Camcorder footage, still photographs and voice recorders were later examined and nothing of note was found. Again we have come away from the Kings head with more questions than we found answers for. The timing of some of the phenomena with others was noted however we are unable to find a reasoning for this. We feel that certainly there are events occurring here that we cannot find answers for. The extent of sightings and information given clairvoyantly continues to interest us. For a building that had little to offer in the way of reported paranormal activity there were unexplained events during our investigation and another interesting night was had. 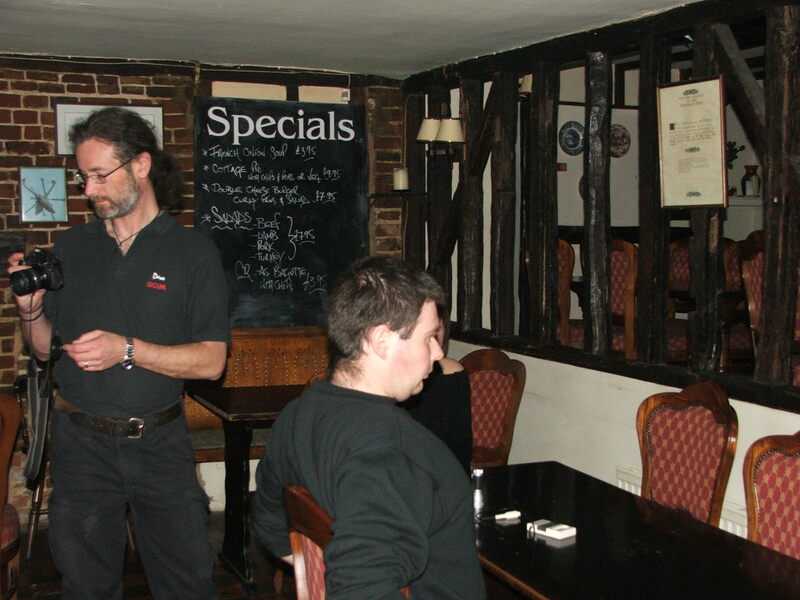 Ghost Connections would like to thank Simon for the second invitation to investigate The Kings Head and also extend our thanks to Emma and Simon for keeping us company for the night and contributing to the investigation.